Update 2: Engadget has learned via a tweet from an EA Access Twitter account that subscribers will only have about six hours of time to spend with the full version of Madden NFL 15 before the game releases, we assume, before the demo kicks them off. Update: EA has now confirmed that Access will cost £3.99 per month in the UK. That will give gamers access to FIFA 14, Madden NFL 25, Peggle 2 and Battlefield 4, with more titles to be added soon, we're told. Electronics Arts has announced a new subscription plan that will let Xbox One owners play some of its biggest games for only $4.99 (about AU$5.31) a month or $29.99 (about AU$31.96) for a full year. The video game publisher announced the new service, called EA Access, launched into beta today, giving a limited number of players access to four select titles. They are FIFA 14, Madden NFL 25, Peggle 2 and Battlefield 4. EA Access subscribers will also have trial access to future titles like Dragon Age: Inquisition up to five days ahead of their launch date. Additionally, subscribers will get 10% off digital EA goods they purchase on the Xbox One, whether it be a new game or season pass like Premium for Battlefield 4. 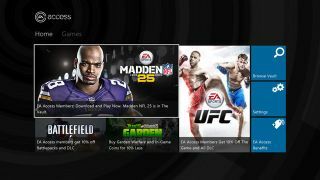 More games are due soon and in the nearer future, the EA Access beta will launch for everyone on Xbox One. It's a surprising move from EA which, according to the Comsumerist, was a two-time worst company in America "winner" for treating its customers poorly, among other complaints. Guess it finally got the message? The deal could prove good for consumers as it gives gamers multiple games for a fraction of the cost. Of course, this means players will have to continue paying in order to access their games, but it's still an unprecedented package. The real questions now are how quickly EA will add new games and when will it open up greater access the beta. How will EA Access rival PlayStation Now on the PS4?